Stirling, Scotland, 29 November 2018 – Angus Council has embraced an online, cloud-based mapping and data service from thinkWhere as a core part of its enterprise Geographical Information System (GIS) architecture. The fully hosted solution now provides access to more than 400 individual map layers for hundreds of staff and members of the public. 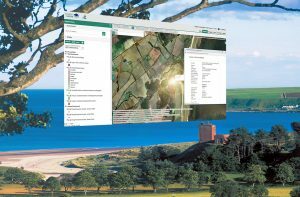 Called Location Centre, the thinkWhere solution integrates with open source desktop GIS software and databases holding key georeferenced data including the Council Address Gazetteer. The Geographic Information System (GIS) is used throughout Angus Council, from road asset management, to waste collection services, and business rates to voter registration. Location Centre manages more than a hundred embeddable maps and bespoke reports, and is accessed by around 300 regular users. Location Centre also powers the mapping element of Angus Council’s public facing website, allowing residents and local businesses to access map based information and customised reports.